Visit our Cyber Store now to get free two-day shipping on orders of our special skin-care products. Dr. William Georgis knows that for beautiful cosmetic surgery results, you need superior care. He understands that cosmetic surgery is not just about how you want to look — it's about how you want to feel. Recognizing that every surgery is as individual as the patient who chooses it, Dr. Georgis will devote his full attention to understanding your goals and helping you feel comfortable with the process. Dr. Georgis realizes that most people wish to look better, but do not wish to have that operated look. He prides himself on his ability to perform surgery with dramatic results that don't look artificial. Dr. Georgis is the caring, supportive, and down-to-earth plastic surgeon you have been looking for. He has performed breast enlargement, liposuction, abdominoplasty or tummy tuck, mommy makeovers, facelifts, and rhinoplasty for over 25 years. Dr. Georgis is certified by the American Board of Plastic Surgeons, the only plastic surgery board recognized by the American Board of Medical Specialists. He is also a member of the American Society of Aesthetic Plastic Surgeons, the prestigious group of Board Certified Plastic Surgeons who specialize in Cosmetic Surgery. He is one of 110 physicians to have earned the "Certificate of Advanced Education in Cosmetic Surgery." His office operating room is accredited by the AAAHC, and is one of the few office operating rooms in Rockford with that distinction. Many doctors claim to be plastic surgeons. 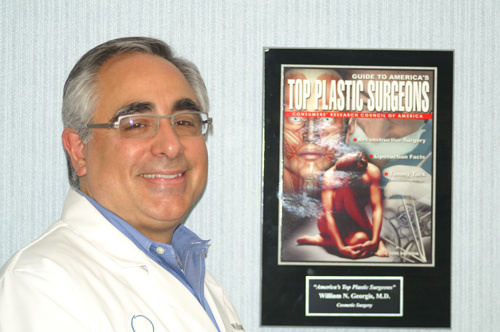 Dr. Georgis is proud to be certified by the American Board of Plastic Surgeons.